Two significant human rights instruments, namely the Universal Declaration of Human Rights (UDHR) and the African Charter on Human and People's Rights (ACHPR) are enshrined in the Constitution of the Republic of Cameroon. In the preamble, which according to Article 65 is part and parcel of the Constitution, the state recognizes and affirms "...the fundamental freedoms enshrined in the Universal Declaration of Human Rights, the Charter of the United Nations and The African Charter on Human and Peoples' Rights, and all duly ratified international conventions...". Mindful of the aforementioned, the imprisonment of an author for "insulting" the first lady of the republic, Chantal Biya (see photo), in a book is therefore unconstitutional and a violation of "duly ratified" international human rights conventions. International Freedom of Expression Exchange (IFEX), a network of organizations that promote and protect the right to free expression, issued an alert on 29 March 2011 condemning the imprisonment of Bertrand Teyou, a Cameroonian author, for "insulting" the First Lady of Cameroon in a book that was published last year. According to IFEX, in 2010, Bertand Teyou published a book titled "La belle de la république bananière: Chantal Biya, de la rue au palais" (meaning: the beautiful of the banana republic: Chantal Biya, from the streets to the palace). The author was arrested in November 2010 and slapped with a fine or 2 years in prison. Freedom to hold and express opinions without state interference is a fundamental right and the foundation of a free and democratic society. This right is laid down in all significant human rights instruments, including the UDHR (Article 19), the ACHPR (Article 9 ), the International Covenant on Civil and Political Rights (Article 19), just to name a few. The arrest and imprisonment of an author as a result of his publication is outrageous and contravenes every international human rights standard. Bertrand Teyou is presently serving 2 years in prison due to his inability to pay the high fine of 2 million CFA francs plus other costs levied on him for writing a book about a public figure. Note that Bertrand is not the first Cameroonian imprisoned - in violation of free expression. Many have been imprisoned before him, including a prominent musician, popularly known as Lapiro de Mbanga - who is presently imprisoned after composing a song against the recent controversial constitutional amendment that eliminated presidential term limits in Cameroon. A declaration of the Committee for the Liberation of Bertrand Teyou reveals that First Lady Chantal Biya never lodged a complaint against Bertrand Teyou. Regional authorities in the economic capital - Douala - took upon themselves to arrest, prosecute and sentence the author before a planned celebration marking the publication of his book. PEN International, an organization that promotes literature, encourages supporters to TAKE ACTION to secure the immediate and unconditional release of Bertrand Teyou. 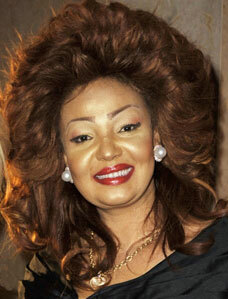 *Photo: First Lady Chantal Biya. Cameroon is one of the countries in the world with the greatest freedom of speech. If all those who insult the President and wife to be imprisoned then there will be no space left in our prisons. Teyou’s arrest simply results from the application of the law. Go through Teyou’s book then you’ll know why he was jailed. It is good to write but we need to be objective and responsible when we write. Cameroon is a lawless country where it's citizens are governed by the whims and caprices of those termed (big guns)whatever happened to the notion of freedom of speech?it's massacred in Cameroon. How did the journalist Bibi Ngota end up?he died in jail.Bibi Ngota was arrested for a press related offence that is yet to be elucidated. Bertrand Teyou is just another victim.